With the organic, pencil feel of yesteryear, Hidden Fields evokes nostalgia and horror with Mundaun, an adventure to a small town in the Alps beset by something diabolical. The game feels like an artist’s notebook come to life, and I caught up and conversed with developer Michel Ziegler (Director, Artist, Game Designer) on the creative thrust behind his work. 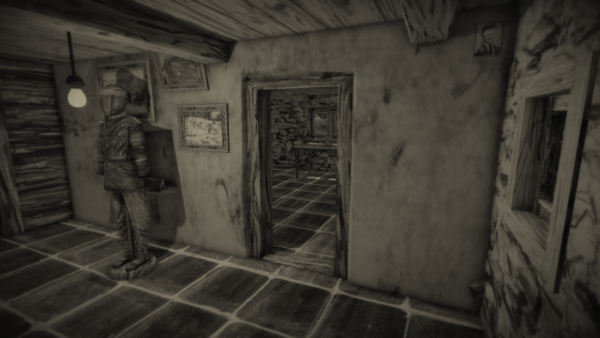 Erik Meyer: The black-and-white hand-drawn feel creates a look I liken to Edward Gorey or Charles Addams, obviously translated onto a 3d experience, so when it comes to the technical challenge of creating textures and in-game art, what has created hurdles, and how have you moved from project genesis to cohesive levels? Michel Ziegler: The great thing about working in a rather painterly way with pencil is that it is quite forgiving when it comes to mapping it onto a 3D model. To work in a strictly linear drawing fashion, I imagine, would be a nightmare, as you would see every bit of warping of the lines on the 3D model. It is sometimes a bit of a challenge to wrap your brain around where something you draw on a flat piece of paper will end up on the 3D model. When working in an analogue fashion, you have a disconnect there and you only see how the thing you draw looks after scanning the drawing and applying it to the 3d model. I do enjoy that part though as it is always a bit of a surprise. That said, I sometimes scan a rough drawing first to see if it generally works before working on. After working with this process for some years, it kind of becomes second nature and after some early experiments and detours, the drawing style has converged nicely into a cohesive whole. 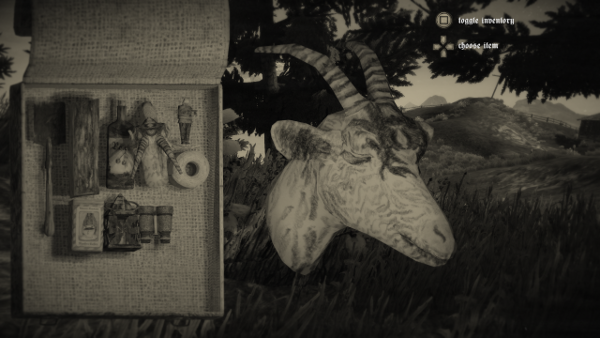 EM: I enjoy both the inclusion and framing of odd details (the goat’s head, for example), but as a horror game, there’s a careful balance to be struck between odd and silly, so what criteria do you hold when deciding what interactive objects to include and what to give weight to? And what kinds of things came close but ultimately didn’t make the cut? EM: Difficulty, in-game placement, connection to narrative, balance within the overall experience, and similar considerations regarding puzzles make for many cautionary tales. By way of example, in Lighthouse: The Dark Being, puzzles were difficult or glitchy, interrupting the flow in frustrating ways, whereas the hacking system involving pipe connections in BioShock felt fairly fluid. As a designer, how do you approach minigames and strategic challenges within your work? MZ: That is a huge challenge. On one hand, I want the player to have to discover things and not just guide him down a corridor. A sense of curiosity in discovering the secrets in the world of Mundaun must be awakened in the player. I try to do that by putting interesting details in every corner, so the player feels it is worth it to be lost for a second. On the other hand, how can I make sure that the player isn’t just stuck, because he didn’t spot an item in one of the barns? I try to make the maps a size that is small enough for the player to explore carefully enough to find things, yet big enough to give a sense of space and openness. Also, I try to give subtle pointers in the task descriptions or the environment that feel organic. I’m experimenting with ways to give the player a pointer, only if needed. For example, there is a little girl sitting high on a wooden construction and singing. If the player listens, he will spot her and can interact with her. If the player misses her and moves past her, the camera could then turn towards her. Players who hear and spot her by themselves will never receive that hint. As for the mini-games and puzzles themselves, I don’t necessarily want them to be very obscure but rather as diverse as possible. EM: Regarding narrative and plot, we know the protagonist is in a secluded valley in the Alps following his grandfather’s mysterious death in a fire, and something old and diabolical is haunting the locals. As compared with written texts, a free-form walking simulator has visual and auditory elements at its disposal, so what has your development process looked like regarding writerly pacing, memorable interactions, and the creation of mood? MZ: I started with a general idea about what the story should feel like rather than be specifically. That gives me a degree of flexibility in choosing elements of a narrative that also work visually as well as gameplay-wise. It is a constant interplay of all the different aspects of a game. I work on the narrative in text form, and when I start implementing that, new ideas emerge. Also, I have a large library of photos I took on location in the Alps or all sorts of things and collected, many more images in books and archives. These also feed into the process of creating the mood and also specific content that could fit the narrative. Every few months or so, I revisit the text script and adapt it to what I designed and what I have learned in that time about the story. It’s a very organic process, and I hope the finished game reflects that. EM: The control mechanics behind sleighs and hay loaders shift the feel, as opposed to walking, so what is your philosophy behind alternate means/methods of travel? Do they work better as ways to transition between different areas, or do they make us look at the same terrain with different eyes, or do they accomplish other things entirely? MZ: I always enjoyed the driving sections in Half-Life 2: Driving a bit, seeing an interesting building, and getting out to investigate. One of the first ideas for Mundaun was to have one of those hay loader vehicles in the game (see http://mundaun-game.ch/blog/page/12/ the very first blog post ;). I’ve always been fascinated with how they could even navigate the steepest of terrain while collecting the lanes of cut hay. Initially, the vision for the game was “Eraserhead meets Farming Simulator”. That vehicle is integrated into the game not just as a means of transportation, as you have to collect the hay on the hills with it to bring to a guy for his goats. It belonged to the deceased, and I want it to be almost like a character in the game. When the player looses it, he can call it with a toy car version of it from his backpack. It will then appear nearby, flashing its lights and playing its radio so the player can find it. The sleigh seemed like a no-brainer, as one map is a snow-covered summit region. 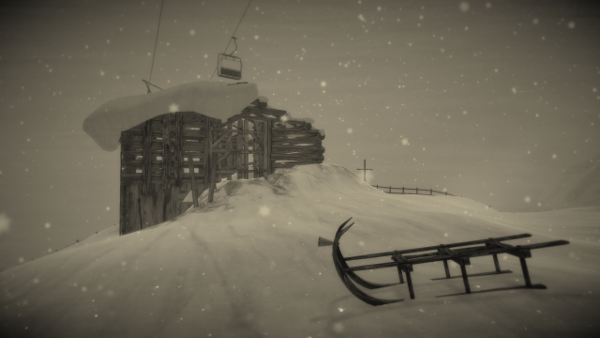 Including exploration on sleigh and mini-games like a slalom race against another character adds to the unique and diverse character of Mundaun. 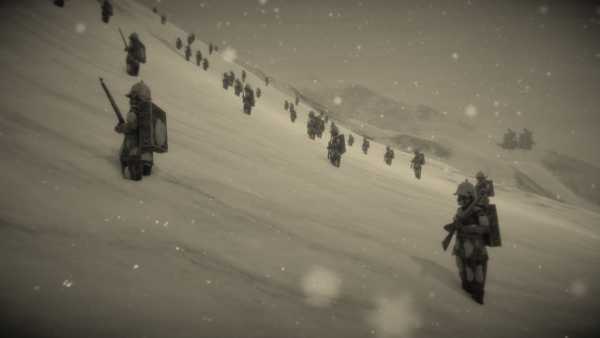 It also allows for elegant player guidance by having a ringing bell point the way to an old soldier buried in the snow. EM: The snow effects bring out something magical in the black-and-white terrain, and as someone who lives in a cold climate, I can attest to the magic of falling snow and buried buildings/houses/bodies, so when we talk about setting, what is it about the crunch of ice beneath boots or the limited visibility of a blizzard that feels so alive and otherworldly? MZ: It is, for one thing, a nice contrast to the darker parts of Mundaun. The stark brightness of all the white snow makes the things hidden in it look very dark, almost charred. 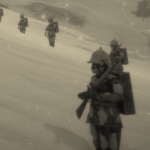 I think it works especially well because the game is black and white. Many early photos of groups of alpinists posing on glaciers have this powerful aesthetic. That said, a lot of the time, it is bright and sunny in Mundaun. A clear sky above the world can be as oppressing as darkness in my opinion. Variety and contrast are very important to me and the change of weather, light, and shadow over the course of the game make the journey of the player feel like an odyssey. EM: I’ve asked this question of a few developers, but I feel like location of the actual developer can give keen insights into projects and pull back the curtain a bit; you live in Lucerne, Switzerland, so what does your world look like, in terms of dev community, local community, and people serving as sounding boards? What kinds of things find their way into your work based on where you are, as opposed to who you are? MZ: Lucerne is very quiet. You can count the game devs here on one hand. I sometimes appreciate that, as I am the kind of person who likes to code and draw undisturbed in his little hidden room. There are bigger communities in other Swiss cities. I have been engaging with them in the last year, and it has been very useful to get a feel for how people react to Mundaun and has provided some feedback. Most of the inspiration for Mundaun specifically comes from the alpine region of Grisons in the east of Switzerland, where I have spent a lot of time visiting since I was born. As for Lucerne, I studied Illustration here, and there is a big community of people who love drawing, so I think that feeds into how I think and work a lot. I think I get most of my visual and narrative inspiration from sources outside of games. EM: With regard to Hidden Fields, your development studio, you talk about a focus on aesthetics and a need to bring hand-made and imperfect sensibilities into games, so can you expand more on this larger studio vision and the benchmarks that lay between where you are now and where you aim to be at release? MZ: Drawing and painting on paper or using analogue printing processes is just the way I like to work. I appreciate and need the degree of randomness that comes with that. It hopefully makes what Hidden Fields does stand out a bit which can only be positive in this crowded market. There is no rational motive behind this though. The quest for something different and unique for some reason is just very important to me personally. I’m very happy about how Mundaun is shaping up as the release draws nearer. It becomes more cohesive as a whole all the time, sometimes by just adding little touches.